With the high of 63, you couldn’t have asked for a better November game day. Although the sun hid behind a cloak of gray skies for part of the day, the crisp autumn air energized us throughout our pregame festivities. And the best part of the day – having my daughter, Aly, and friends Hank and Laurie there to tailgate with us. I hadn’t seen Aly since Memorial Day weekend. She’s a graduate student at the University of Waterloo in Canada, so she doesn’t have a lot of free time to come home for a visit. And since I switched jobs this past summer, I haven’t been able to take time off to visit her. I’d been missing her like crazy, so I couldn’t wait to spend time with her for a few days. 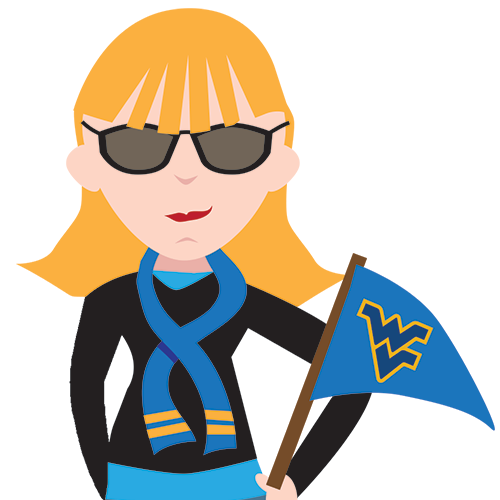 She picked the weekend based on the WVU football schedule because she wanted to tailgate. I also hadn’t seen Laurie and Hank since I moved to Morgantown in mid June. Although Laurie is an avid Buckeye fan, they come to tailgate and enjoy some gridiron glory with us once a year. They’ve been doing it since I first introduced them to game day in Morgantown about 15 years ago. They also brought their 130-lb. Leonberger, Gus. He’s the newest addition to this annual tradition. Having Gus at our tailgate was like having a celebrity there. We could’ve made some serious dough if we had charged $1 for every photo with him. Since we finally had a 3:30 game instead of the dreaded noon game time, Dave made my favorite tailgate dish – filet kabobs over rice. With a mid afternoon game, we also had time to create a memorable, curtain-rising tailgate. We played games, danced and group sang a few favorite tunes like Piano Man. Let’s just say there were thrills all through the mountain hills on this glorious autumn afternoon. As game time neared, we folded up our tents and headed to the stadium to cheer on our Mountaineers. Our beloved Eers weathered the No. 15 Cyclones with a 20-16 victory. It was a perfect end to a perfect day. Here are some photo highlights of our day!